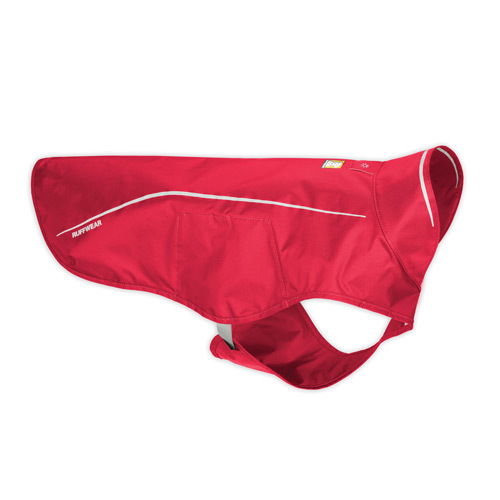 The Ruffwear Sun Shower Dog Rain Jacket is perfect for inclement weather. 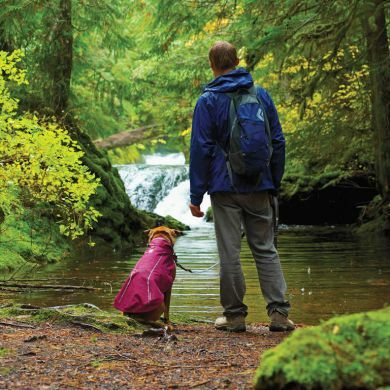 The raincoat uses waterproof fabric to keep the rain out and the non-insulated design allows for use in warm climates, even during our hot Australian summer months. 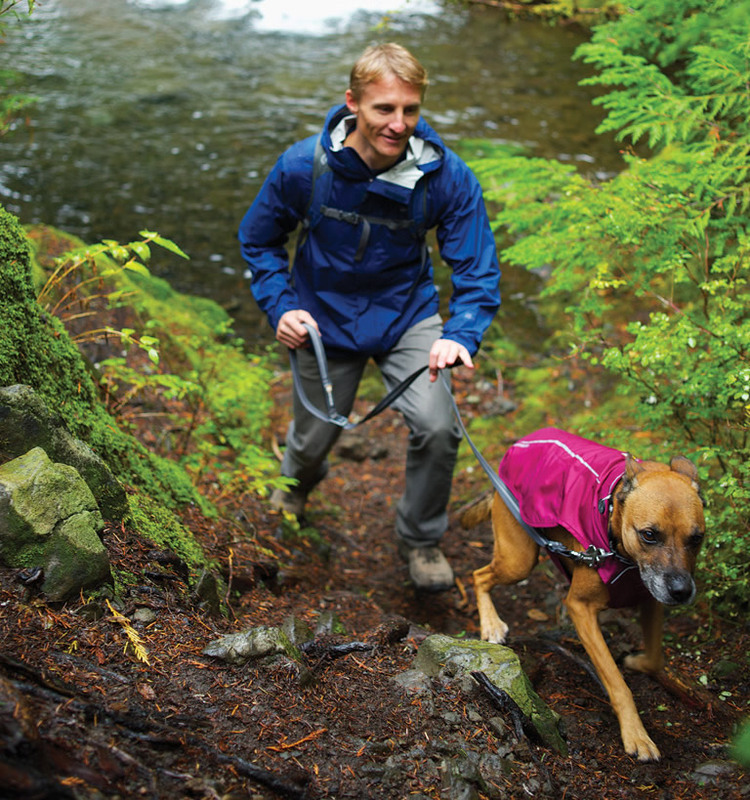 In cooler months, the Sun Shower Rain Jacket can be worn over insulating layers such as the Ruffwear Climate Changer Fleece Jacket for warmth and rain protection. 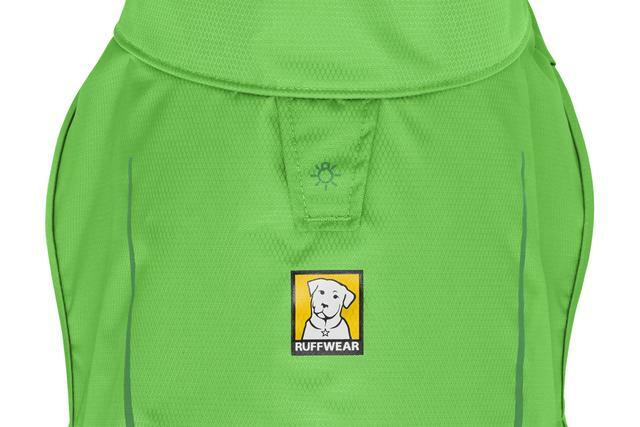 Low-light visibility with reflective trim and light loop for attaching a Ruffwer Beacon reflective dog light. 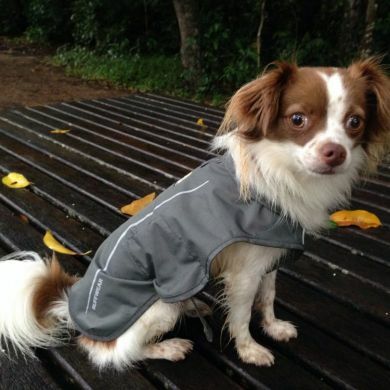 This Sun shower coat was just what I wanted. 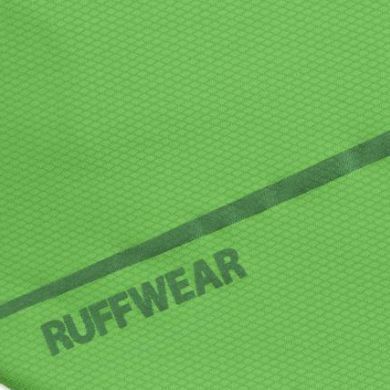 It was light weight and bright in colour with reflective bits, and fit exactly as per the size chart. Easy to put on if the dog keeps still !!! 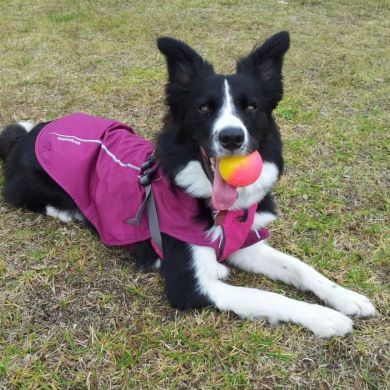 I love the Sun Shower Rain Jacket on my active, eight month old pooch, Lucy. 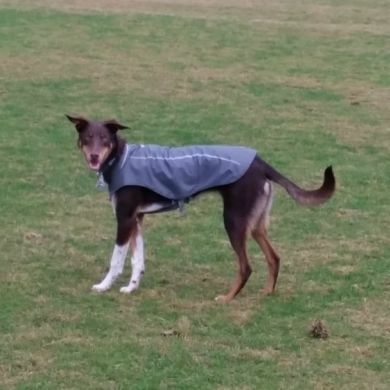 It keeps her dry when we're out walking in the rain, and as it is unlined, Lucy doesn't get too warm when she's running about playing fetch. 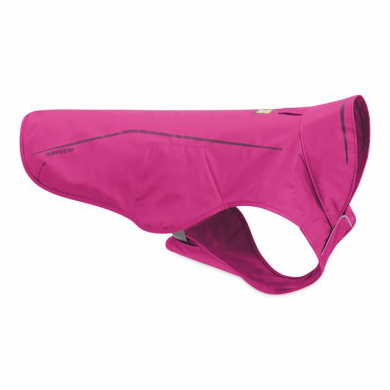 The design fits her slender physique snugly, allowing her to move freely, and the adjustable buckles provide sufficient room for her to grow, or wear a fleece under it. 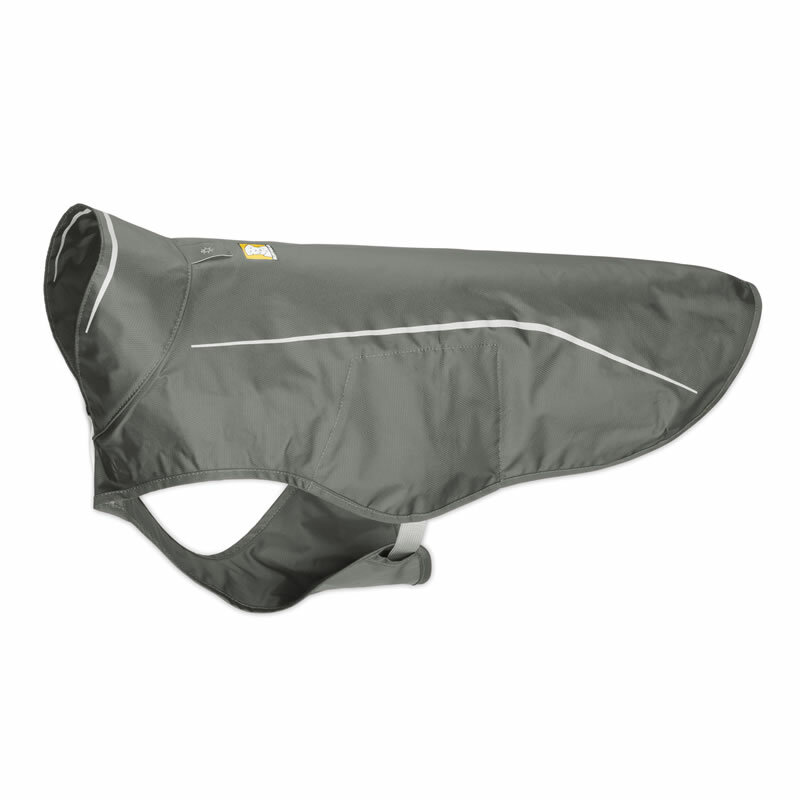 Read 18 customer reviews of Ruffwear Sun Shower Waterproof Rain Jacket. The average customer rating is 4.9. 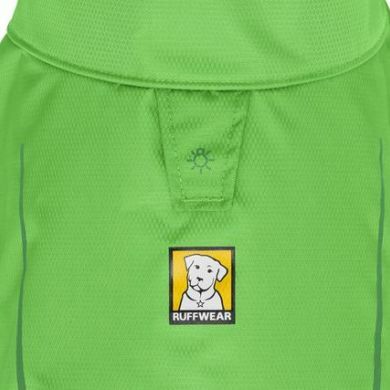 The SunShower jacket fits my guide dog wonderfully and the Ruff Wear beacon is very visble on his back on the provided loop. It fits easily and comfortably under his harness and I love the chest/tummy flap for keeping him dryer in the cold winter showers. 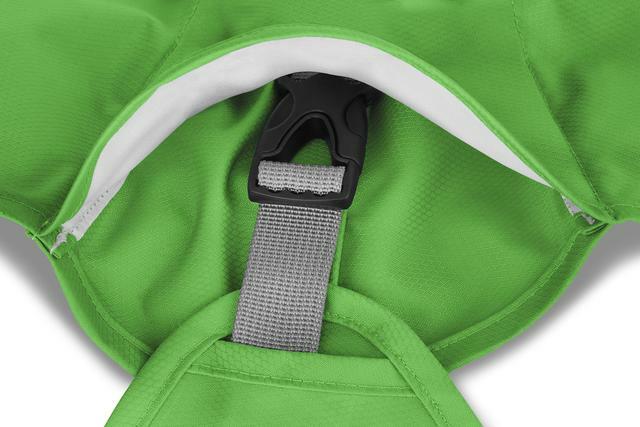 The clips are easily located and secured without sight. I may need a bigger one soon as my boy, now just two is still growing! Good movement while wearing the coat was important I was impressed. I love the Ruffwear raincoat, it is light weight, folds up small and easy to carry with me wherever I go. 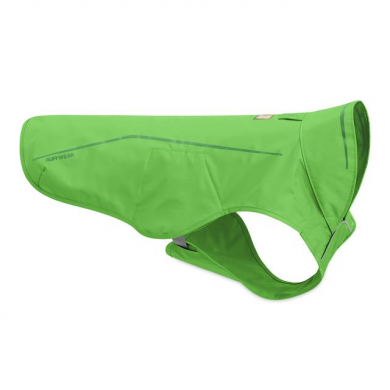 It fits well underneath my Guide Dogs Harness and doesn't seem to restrict his movement. I would highly recommend this as a lightwear raincoat. 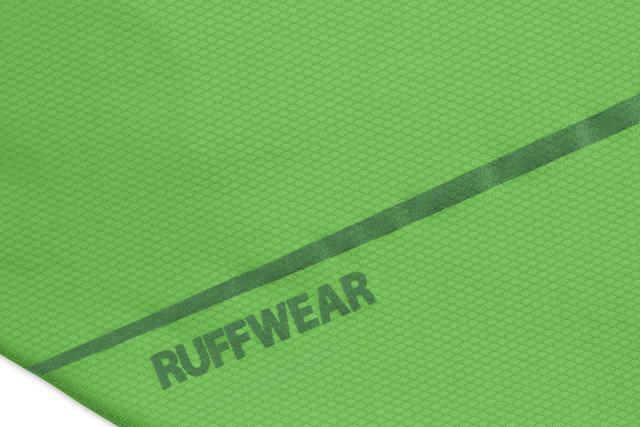 I love the reflective strips for night walking, and so far the material proves to be durable. I was replacing a cloud chaser which has served us well. Dexter has not got some middle aged spread and needed a slightly bigger size. We found the sun shower very easy to put on, worked well to keep him dry and fitted well too. I am so happy with our Ruffwear Sun Shower Waterproof Rain Jackets . 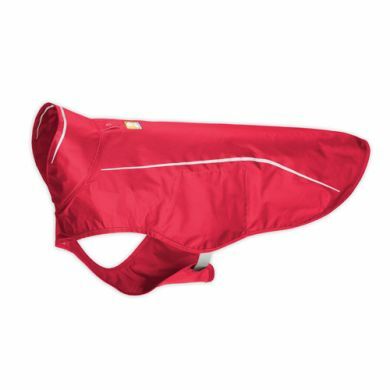 I bought one for each of my dogs and we use them on rainy days for our walks. 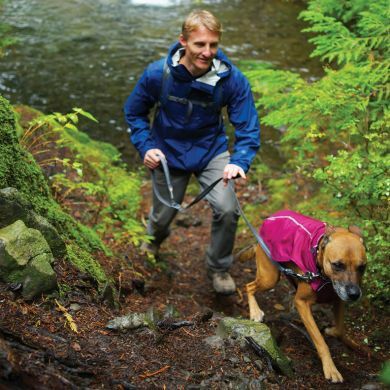 I wanted a well fitted water proof jacket without a thick lining as on long walks the dogs can get over heated.These jackets fit really well and are good quality. They also look attractive. 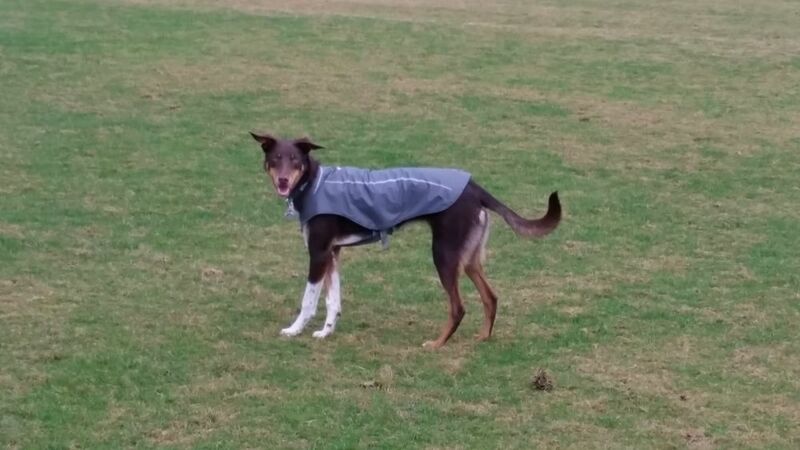 Zoe helped with sizing online and the jackets were received in no time. Excellent service! Today was the first real test of the Ruffwear sun shower Jacket and I was most impressed , the fit was really good and Charli returned home nice and dry and the rain was quite heavy. So happy with. 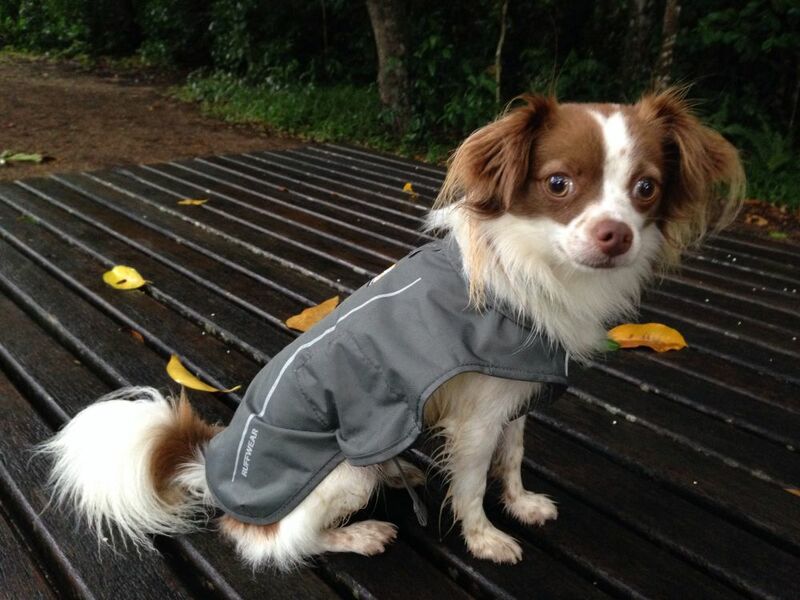 my doggies rain jackets. I bought one a while ago for my little fellow, and now with a new addition just had to get another. Easy to put on and off, they are lightweight, so doggies don't get too hot. Overall very impressed with them. In a downpour it keeps her dry quite well. It would be better if it had more coverage at the back over the hindquarters. 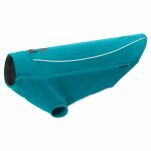 Fantastic quality, and folds up to a tiny size. 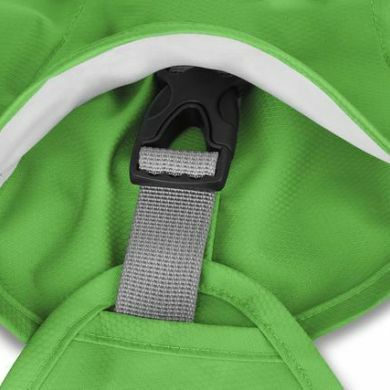 I didn't even notice the buckles were hidden nicely under flaps, that's a bonus. 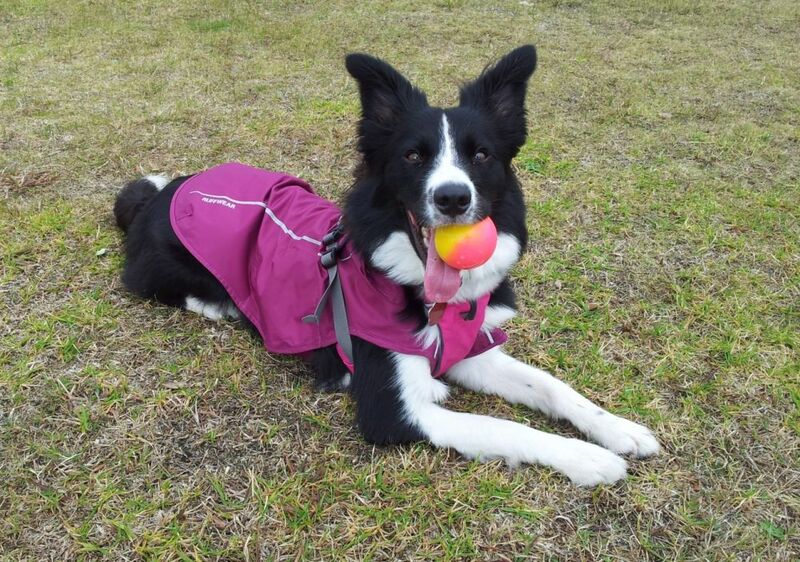 Our 1yr old Border Collie doesn't even care she has it on, and looks stunning in the Purple Dusk. Coverage is good, we only have to dry her head, tail and feet now.